Great weather…great tour…Thank You, Whitewood! 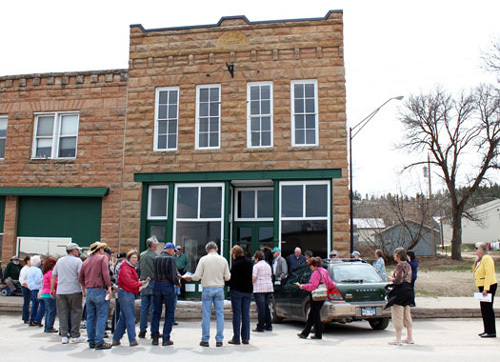 The Spring Tour of the Lawrence County Historical had 42 participants sign in for a day of perfect weather as we toured the ghost town of Crook City, SD and the survivor of 125 years Whitewood, SD. The city of Whitewood were our hosts for the day and outdid themselves in teaching us about the history of their town. We started the day with the group driving to the site of Crook City. Jerry Bryant did a great presentation on the location of the old town with a collection of old photographs he used to take us back in time when it was a bustling mining town. When the railroad chose Whitewood as its terminus, it was the death knell of Crook City. Mary Livingston, the Whitewood historian who made the arrangements for the rest of the day, met us at the Crook City location and then led us to Whitewood, pointing out the location of the old railroad bed that went between Whitewood and Deadwood. The next location to visit was the Senior Citizen Center in Whitewood, where a delicious lunch waited for us. The group enjoyed the soup and sandwiches before going on the walking tour of Whitewood (photo above) that Mary led with the assistance of Whitewood Mayor Deb Schmidt. Whitewood is observing the 125th anniversary of the town's founding this year, and Mary Livingston has been researching its history. She distributed a great brochure that showed the historic buildings and their stories. It included the Lane Hotel, the Jones Building, the Uhlig Store, theBonniwell Building, the Whitewood Banking Company Building, the Methodist Church, the Danish-American Creamery, the Whitewood School, and the United Presbyterian Church. At each location the story of Whitewood and its residents unfolded by the able storytellers. City Hall had a display of historic photos for all to read and enjoy and the Presbyterian Church windows, dating from about 1911 were enjoyed by all before we ended the wonderful tour with pie and coffee served in the fellowship hall. The people of Whitewood made it a pleasure to have our annual Spring Tour. Thank you! Editor's note: Visit our Spring Tour Photo Gallery to get a glimpse of this great tour.